Mechanical treatments include the use of catheters to directly deliver (during angiography) a clot-disrupting or retrieval device to a thromboembolus that is occluding a cerebral artery. Most devices are used in cerebral vessels that are 2–5 mm. Mechanical thrombolytic devices can remove a clot in a matter of minutes, whereas pharmaceutical thrombolytics, even those delivered intra-arterially, may take as long as 2 hours to dissolve a thrombus. [13, 14] The most recently developed devices, known as stent retrievers or stentrievers, have shown higher recanalization rates and better outcomes than those seen with the older Merci Retriever. [15, 16] First-line contact aspiration was also not shown to be superior to first-line stent retriever use in achieving revascularization at the end of the procedure. However, in a recently presented study, an aspiration first-pass technique was found not to be inferior to stent retrievers for clinical outcomes (International Stroke Conference, January 25, 2018, Los Angeles, CA). More recent trials have required imaging that confirmed large vessel occlusion. [3, 4, 5, 6, 7, 8, 9, 10] In addition, these trials have incorporated the use of newer stent retriever technologies. The trials enrolling patients with large vessel occlusions within 12 hours of symptom onset are described below. MR CLEAN was the first of the positive endovascular treatment trials to be reported. Five hundred patients were enrolled at 16 centers in the Netherlands. Eligible patients could be treated intra-arterially within 6 hours of symptom onset and had an occlusion of the distal intracranial carotid artery (ICA), middle cerebral artery (MCA) (M1 or M2), or anterior cerebral artery (A1 or A2) established by CTA, MRA, or angiography. They needed to have an NIHSS score of 2 or more. Patients were randomized to intra-arterial treatment plus usual care or usual care alone. Those in the endovascular group received either mechanical thrombectomy, an intra-arterial thrombolytic agent, or both. In the intervention group, 87% received IV tPA compared to 91% in the control group. The majority of the patients in the intervention group were treated with retrievable stents (81.5%). The primary outcome, a shift analysis of the modified Rankin Scale (mRS), showed an adjusted common odds ratio of 1.67 (95% CI1.21-2.30).Functional independence, mRS 0-2, was seen in 32.6% of the intervention group and in 19.1% of the control group (95% CI 5.9-21.2). EXTEND-IA had planned to randomize 100 patients at 14 centers in Australia and New Zealand to IV tPA plus treatment with the Solitaire FR stent retriever or to IV tPA alone, but the trial was suspended after the enrollment of 70 patients after the results of MR CLEAN were reported. Patients were included in the trial if they could receive IV tPA within 4.5 hours of onset and intra-arterial therapy within 6 hours (groin puncture) and had occlusion of the ICA or MCA M1 or M2 segment by CTA. In addition, CT perfusion imaging processed using RAPID software (Stanford University) showed salvageable brain tissue. The primary outcome, an 8 point or more reduction in the NIHSS or a score of 0 or 1 at day 3, was seen in 80% of those in the endovascular group compared to 37% in the control group (p=0.002). More patients in the endovascular group achieved functional outcome (mRS 0-2); 71% versus 40% in the control group, p=0.01. More patients had also undergone reperfusion at 24 hours in the endovascular groupcompared to the tPA-only group. ESCAPE had planned to randomize 500 participants to standard care or standard care plus endovascular treatment with the use of available endovascular devices in Canada, the United States, South Korea, Ireland, and the United Kingdom. However, the trial was stopped for efficacy after an unplanned interim analysis was conducted after 316 patients were enrolled due to the release of the results of MR CLEAN. Patients were included in the trial up to 12 hours after symptom onset but were also required to have a small infarct core by CT and CTA, defined as an ASPECTS sore of 6 to 10, and a proximal artery occlusion in the anterior circulation involving the MCA trunk and immediate branches, with or without occlusion of the intracranial ICA. Patients also had to have good collateral circulation, defined as the filling of 50% or more of the MCA pial arterial circulation on CTA. In the intervention arm, 73% received IV tPA and in the control arm, 79% received IV tPA. The primary outcome, a shift analysis of themRS, favored intervention (common odds ratio 2.6, 95% CI 1.7-3.8; p< 0.001). Functional independence, mRS 0-2 at 90 days, was seen in 53% of the intervention group and 29.3% of the control group (p< 0.001). SWIFT-PRIME randomized patients to IV tPA within 4.5 hours plus endovascular treatment with the Solitaire FR stent retriever device, or to IV tPA alone within 6 hours of symptom onset at centers in the United States and Europe. Patients were 18-80 years of age and had an NIHSS of 8-29. Large vessel occlusion of the intracranial ICA or M1 was confirmed by CTA or MRA and patients with large areas of unsalvageable brain tissue by perfusion imaging, and later in the trial by CTA, were excluded. The study was placed on hold after 196 patients had been enrolled due to the release of the other positive trial results. The primary outcome, a shift analysis of the mRS, showed better outcomes in the interventional group (p=0002). Functional independence, mRS 0-2 at 90 days, was also more often achieved in the endovascular group (60.2%) compared to the control group (35.5%). The Randomized Trial of Revascularization with Solitaire FR Device versus Best Medical Therapy in the Treatment of Acute Stroke Due to Anterior Circulation Large Vessel Occlusion Presenting within Eight Hours of Symptom Onset (REVASCAT) study was performed in Spain. The study randomized patients aged 18–80 years of age to treatment with the Solitaire FR stent retriever device or to medical therapy alone. Patients were excluded if they had a large ischemic core, including an ASPECTS score of less than 7 on CT, or an ASPECTS of less than 6 on MRI diffusion weighted imaging. After 160 patients were enrolled, the inclusion criteria were modified to include patients aged 80–85 years with an ASPECTS of more than 8. A total of 206 patients were enrolled in the study. An interim analysis was conducted as planned after 25% of the patients in REVASCAT had completed their 90-day follow up, and enrollment was terminated due to the results of the other trials. The intervention group had a good functional outcome in 43.7% (mRS = 0–2) at 90 days while the control group had a 28.2% good functional outcome rate (adjusted odds ratio 2.1, 95 % CI [1.1 to 4.0]). The last of the more acute thrombectomy trials, the THRombectomie des Ateres CErebrales (THRACE) trial, was performed in France and published in 2016. It included patients aged 18–80 years of age who were randomized to IV thrombolysis alone or to IV thrombolysis plus mechanical embolectomy. IV thrombolysis had to be started within 4 hours of symptom onset and thrombectomy within 5 hours. Proximal cerebral artery occlusion had to be confirmed by CT or MR angiography, but other imaging inclusions were not required. The trial included 414 patients, all of whom received IV tPA. In the mechanical embolectomy group, 83% were treated with stentrievers. The primary outcome of the the trial was the proportion of patients achieving functional independence (mRS 0-2) at 3 months, excluding those patients who were lost to follow-up or had missing data. The primary outcome was seen in 53% of those in the mechanical embolectomy group versus 42% of the IV thrombolysis group (p=0.028). The trials enrolling patients with large vessel occlusions within 6-–24 hours of symptom onset are described below. The DWI or CTP Assessment with Clinical Mismatch in the Triage of Wake-Up and Late Presenting Strokes Undergoing Neurointervention with Trevo (DAWN) trial was performed in the United States, Canada, Europe, and Australia and enrolled patients known to be well 6 to 24 hours earlier. Patients were randomized to thrombectomy, performed using the Trevo stentriever device, plus standard care or to standard care alone. Patients were required to have occlusion of the ICA, first segment of the MCA, or both on CT or MR angiography. Patients also needed to have a mismatch between the severity of the clincial deficit and infarct volume. The mismatch criteria varied for those 80 years of age and older and younger patients. Infarct volume was assessed using either diffusion weighted imaging (DWI) or perfusion CT and was measured using automated software (RAPID, iSchemaView). The coprimary end points were the mean score for disability on the utility-weighted mRS and the rate of functional independence (mRS 0-2) at 90 days. After 206 patients were enrolled in the trial, enrollment was stopped because of the results of a prespecified interim analysis. Nine percent of patients in the trial received IV tPA. The mean score on the utility-weighed mRS at 90 days was 5.5 in the thrombectomy group versus 3.4 in the control group (95% credible interval 1.1-3.0) and the rate of functional independence was 49% versus 13% (95% credible interval 24-44). The rate of symptomatic intracranial hemorrhage (ICH) and 90-day mortality did not differ between groups. Stent retrievers are self-expanding stents that can be deployed and retrieved. When the device is deployed across a thrombus, it pushes the thrombus against the vessel wall and often creates a perfusion channel that immediately starts to reestablish blood flow. The thrombus becomes ensnared within the struts of the stent. The stent is then used to grasp the clot and the stent is retrieved. Three stent retrievers have received FDA clearance. The EmboTrap II stent retriever received FDA clearance in 2018 based on the Analysis of Revascularization in Ischemic Stroke With EmboTrap (ARISE) II trial. ARISE II was a single-arm, prospective, multicenter study that compared the EmboTrap device to a composite performance goal criterion derived from the pivotal trials for the Solitaire and Trevo devices. The primary efficacy end point, modified Thrombolysis in Cerebral Ischemia (mTICI) reperfusion scores ≥2b within 3 passes was achieved in 80.2% (95% confidence interval, 74%–85% versus 56% performance goal criterion; P value, < 0.0001). Functional independence (mRS 0-2) was seen in 67% of patients at 90 days. Concentric MERCI Retriever embedded in a clot. Courtesy of Concentric Medical, Inc, Mountain View, Calif.
Clot retrieved from the basilar artery by using the MERCI Retriever. Courtesy of Concentric Medical, Inc, Mountain View, Calif, and Yu et al, 2003. Symptomatic ICH occurred in 9.8% (16/164) of patients overall and a favorable outcome, a modified Rankin score of 2 or less, was seen in 36% of patients at 90 days. Penumbra aspiration. Courtesy of Penumbra, Inc., Alameda, Calif. In anecdotal reports, interventionists have used retrieval devices to remove thrombi from cerebral vessels. Snares, such as the Neuronet snare (Guidant Endovascular, Santa Clara, Calif), have been developed specifically for use in the treatment of strokes. These devices, which have not yet been evaluated in acute-stroke trials, are simple in design and do not require the clot to be amenable to emulsification. EKOS Micro Infusion Catheter. 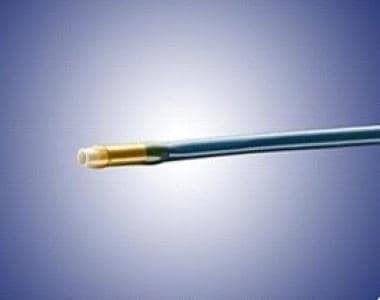 The catheter has a central lumen, an end-hole infusion port, and a 1.7-MHz ultrasound element. Courtesy of EKOS Corporation, Bothell, Wash.
EKOS catheter tip. Courtesy of EKOS Corporation, Bothell, Wash.
Schlieren photograph of EKOS device in operation. Courtesy of EKOS Corporation, Bothell, Wash.
Ultrasound changes the structure of the clot to temporarily increase its permeability while providing an acoustic pressure gradient to move the drug into the clot to speed its dissolution. The EKOS product has not received FDA approval for use against acute stroke. After approximately 20 years of investigation, studies have proven the benefit of endovascular treatment in selected patients with large vessel strokes compared to medical therapy alone. The development of new device technologies, specifically the stent retiever devices, systems changes allowing for early treatment and better patient selection likely contributed to this success. Even prior to the results of recent trials, endovascular therapy has provided a treatment opportunity for patients unable to receive IV tPA or IV tPA non-responders: those that do not arrive at the hospital early enough to receive IV tPA, those who are not thrombolytic candidates due to a recent surgical procedure or other exclusion, and those treated with IV tPA with residual vessel occlusion. Since endovascular treatment has now become the standard of care in stroke therapy, hospitals need to be prepared to offer such therapies or be able to rapidly transfer the patient to a hospital that can provide them. New centers able to provide such treatment will be needed in geographic areas without them. Novel models of stroke care, potentially bypassing centers that cannot provide the full spectrum of care for ischemic stroke patients, will have to be considered. Whether centers can provide endovascular therapy or not, early identification of large vessel occlusion will be critical. Tertiary care centers are likely to obtain CTAs in all nearly all acute stroke patients, treating with IV tPA in those patients that qualify as soon as the non-contrast CT head images are available. Those centers for whom obtaining a CTA is a greater hardship will need to apply generous criteria to determine who will get one and will either be bypassed or will need to transfer the patient to obtain the study elsewhere. There is currently too little data available to compare the performance of mechanical thrombolytic devices with intra-arterial lytics in the treatment of acute stroke. Devices are potentially able to retrieve large clots that pharmaceutical agents are not able to lyse successfully, and large hemorrhages may occur less frequently with device use. In the end, clots may best be treated with a combined approach using various devices, lytics, and antithrombotics. It is likely that such trials will now develop as the next step toward further improving outcomes in stroke patients. NINDS t-PA Stroke Study Group. Tissue plasminogen activator for acute ischemic stroke. The National Institute of Neurological Disorders and Stroke rt-PA Stroke Study Group. N Engl J Med. 1995 Dec 14. 333(24):1581-7. [Medline]. NINDS t-PA Stroke Study Group. Generalized efficacy of t-PA for acute stroke. Subgroup analysis of the NINDS t-PA Stroke Trial. Stroke. 1997 Nov. 28(11):2119-25. [Medline]. Berkhemer OA, Fransen PS, Beumer D, van den Berg LA, Lingsma HF, Yoo AJ, et al. A randomized trial of intraarterial treatment for acute ischemic stroke. N Engl J Med. 2015 Jan 1. 372(1):11-20. [Medline]. Campbell BC, Mitchell PJ, Kleinig TJ, Dewey HM, Churilov L, Yassi N, et al. Endovascular Therapy for Ischemic Stroke with Perfusion-Imaging Selection. N Engl J Med. 2015 Feb 11. [Medline]. Goyal M, Demchuk AM, Menon BK, Eesa M, Rempel JL, Thornton J, et al. Randomized Assessment of Rapid Endovascular Treatment of Ischemic Stroke. N Engl J Med. 2015 Feb 11. [Medline]. Jovin TG, Chamorro A, Cobo E, de Miquel MA, Molina CA, Rovira A et al. Thrombectomy within 8 hours after symptom onset in ischemic stroke. N Engl J Med. 2015 Jun 11. 372 (24):2296-306. [Medline]. Saver JL, Goyal M, Bonafe A, Diener HC, Levy EI, Pereira VM, et al. Stent-retriever thrombectomy after intravenous t-PA vs. t-PA alone in stroke. N Engl J Med. 2015 Jun 11. 372 (24):2285-95. [Medline]. Bracard S, Ducrocq X, Mas JL, Soudant M, Oppenheim C, Moulin T, et al. Mechanical thrombectomy after intravenous alteplase versus alteplase alone after stroke (THRACE): a randomised controlled trial. Lancet Neurol. 2016 Oct. 15 (11):1138-47. [Medline]. Nogueira RG, Jadhav AP, Haussen DC, Bonafe A, Budzik RF, Bhuva P, et al. Thrombectomy 6 to 24 Hours after Stroke with a Mismatch between Deficit and Infarct. N Engl J Med. 2018 Jan 4. 378 (1):11-21. [Medline]. Albers GW, Marks MP, Kemp S, Christensen S, Tsai JP, Ortega-Gutierrez S, et al. Thrombectomy for Stroke at 6 to 16 Hours with Selection by Perfusion Imaging. N Engl J Med. 2018 Feb 22. 378 (8):708-718. [Medline]. [Guideline] Powers WJ, Derdeyn CP, Biller J, Coffey CS, Hoh BL, Jauch EC, et al. 2015 American Heart Association/American Stroke Association Focused Update of the 2013 Guidelines for the Early Management of Patients With Acute Ischemic Stroke Regarding Endovascular Treatment: A Guideline for Healthcare Professionals From the American Heart Association/American Stroke Association. Stroke. 2015 Oct. 46 (10):3020-35. [Medline]. [Guideline] Powers WJ, Rabinstein AA, Ackerson T, Adeoye OM, Bambakidis NC, Becker K, et al. 2018 Guidelines for the Early Management of Patients With Acute Ischemic Stroke: A Guideline for Healthcare Professionals From the American Heart Association/American Stroke Association. Stroke. 2018 Mar. 49 (3):e46-e110. [Medline]. Berlis A, Lutsep H, Barnwell S, et al. Mechanical thrombolysis in acute ischemic stroke with endovascular photoacoustic recanalization. Stroke. 2004 May. 35(5):1112-6. [Medline]. Furlan A, Higashida R, Wechsler L, et al. Intra-arterial prourokinase for acute ischemic stroke. The PROACT II study: a randomized controlled trial. Prolyse in Acute Cerebral Thromboembolism. JAMA. 1999 Dec 1. 282(21):2003-11. [Medline]. Lapergue B, Blanc R, Gory B, Labreuche J, Duhamel A, Marnat G, et al. Effect of Endovascular Contact Aspiration vs Stent Retriever on Revascularization in Patients With Acute Ischemic Stroke and Large Vessel Occlusion: The ASTER Randomized Clinical Trial. JAMA. 2017 Aug 1. 318 (5):443-452. [Medline]. Demchuk AM, Goyal M, Yeatts SD, Carrozzella J, Foster LD, Qazi E, et al. Recanalization and clinical outcome of occlusion sites at baseline CT angiography in the Interventional Management of Stroke III trial. Radiology. 2014 Oct. 273(1):202-10. [Medline]. [Full Text]. Broderick JP, Palesch YY, Demchuk AM, Yeatts SD, Khatri P, Hill MD, et al. Evolution of practice during the Interventional Management of Stroke III Trial and implications for ongoing trials. Stroke. 2014 Dec. 45(12):3606-11. [Medline]. Yeatts SD, Martin RH, Coffey CS, Lyden PD, Foster LD, Woolson RF, et al. Challenges of decision making regarding futility in a randomized trial: the Interventional Management of Stroke III experience. Stroke. 2014 May. 45(5):1408-14. [Medline]. [Full Text]. Ciccone A, Valvassori L, Nichelatti M, Sgoifo A, Ponzio M, Sterzi R, et al. Endovascular treatment for acute ischemic stroke. N Engl J Med. 2013 Mar 7. 368(10):904-13. [Medline]. [Full Text]. Kidwell CS, Jahan R, Alger JR, Schaewe TJ, Guzy J, Starkman S, et al. Design and rationale of the Mechanical Retrieval and Recanalization of Stroke Clots Using Embolectomy (MR RESCUE) Trial. Int J Stroke. 2014 Jan. 9(1):110-6. [Medline]. [Full Text]. Zaidat OO, Bozorgchami H, Ribó M, Saver JL, Mattle HP, Chapot R, et al. Primary Results of the Multicenter ARISE II Study (Analysis of Revascularization in Ischemic Stroke With EmboTrap). Stroke. 2018 May. 49 (5):1107-1115. [Medline]. Smith WS, Sung G, Starkman S, et al. Safety and efficacy of mechanical embolectomy in acute ischemic stroke: results of the MERCI trial. Stroke. 2005 Jul. 36(7):1432-8. [Medline]. Smith WS. Safety of mechanical thrombectomy and intravenous tissue plasminogen activator in acute ischemic stroke. Results of the multi Mechanical Embolus Removal in Cerebral Ischemia (MERCI) trial, part I. AJNR Am J Neuroradiol. 2006 Jun-Jul. 27(6):1177-82. [Medline]. Hassan AE, Aman MM, Chauhdry SA, Grigoryan M, Tekle WG, Rodriguez GJ, et al. Value of Other Endovascular Techniques Among Patients with MERCI Device Failure during the Treatment of Acute Ischemic Stroke: What to do when MERCI fails?. J Vasc Interv Neurol. 2013 Feb. 5(2):9-13. [Medline]. [Full Text]. Mpotsaris A, Bussmeyer M, Weber W. Mechanical Thrombectomy with the Penumbra 3D Separator and Lesional Aspiration: Technical Feasibility and Clinical Outcome. Clin Neuroradiol. 2013 Jul 28. [Medline]. Kim YW, Kang DH, Hwang JH, Park J, Hwang YH, Kim YS. Rescue strategy for acute carotid stent thrombosis during carotid stenting with distal filter protection using forced arterial suction thrombectomy with a reperfusion catheter of the Penumbra System: a technical note. Acta Neurochir (Wien). 2013 Aug. 155(8):1583-8. [Medline]. Bose A, Henkes H, Alfke K, Reith W, Mayer TE, Berlis A. The Penumbra System: a mechanical device for the treatment of acute stroke due to thromboembolism. AJNR Am J Neuroradiol. 2008 Aug. 29(7):1409-13. [Medline]. Penumbra Pivotal Stroke Trial Investigators. The penumbra pivotal stroke trial: safety and effectiveness of a new generation of mechanical devices for clot removal in intracranial large vessel occlusive disease. Stroke. 2009 Aug. 40 (8):2761-8. [Medline]. The IMS II Trial Investigators. The Interventional Management of Stroke (IMS) II Study. Stroke. 2007 Jul. 38(7):2127-35. [Medline]. Nogueira RG, Smith WS, Sung G, Duckwiler G, Walker G, Roberts R, et al. Effect of Time to Reperfusion on Clinical Outcome of Anterior Circulation Strokes Treated With Thrombectomy: Pooled Analysis of the MERCI and Multi MERCI Trials. Stroke. 2011 Nov. 42(11):3144-3149. [Medline]. 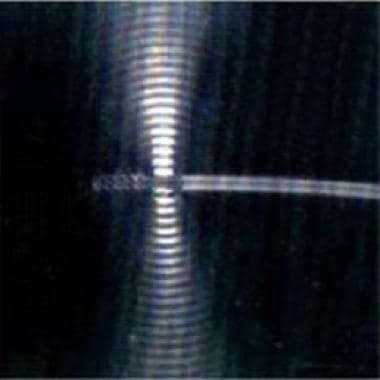 AngioJet catheter, shown with its saline jets activated. Courtesy of Possis Medical, Inc, Minneapolis, Minn.
Possis Neuro Catheter. Courtesy of Possis Medical, Inc, Minneapolis, Minn.
Endovascular Photo Acoustic Recanalization (EPAR) system. 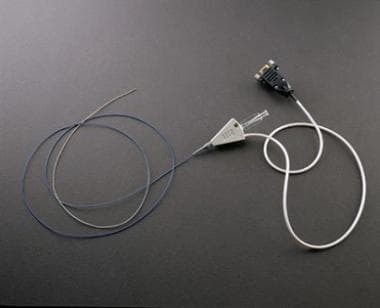 Image shows the laser energy source and catheter. Courtesy of EndoVasix, Inc, Belmont, Calif.
Endovascular Photo Acoustic Recanalization (EPAR) catheter tip. Courtesy of EndoVasix, Inc, Belmont, Calif. Image of a cerebral vessel shows the Endovascular Photo Acoustic Recanalization (EPAR) catheter tip at the treatment site, in the thrombus. Courtesy of EndoVasix, Inc, Belmont, Calif.